Liesbeth van Vliet and Aimee van Wynsberghe are the award winners for the seventh edition of ‘For Women in Science’ this year. On this occasion they will open trading at Beursplein 5. For Women in Science is an initiative from L’Oréal, Unesco, LNVH and the Netherlands Institute for Advanced Study. Each year, the Dutch L’Oréal-UNESCO For Women in Science Fellowship Program hands-out two scholarships of up to €25,000 to female scientists. The participation of women in scientific research is essential for economic, social and cultural development. Nowadays, women achieve the highest academic level; nevertheless, they are still under-represented. 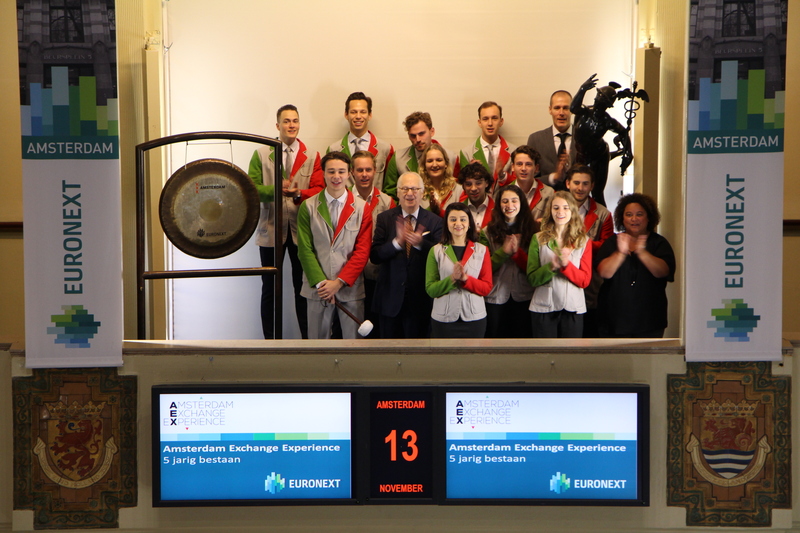 The Amsterdam Exchange Experience (AEX Experience) celebrates it’s 5th anniversary. 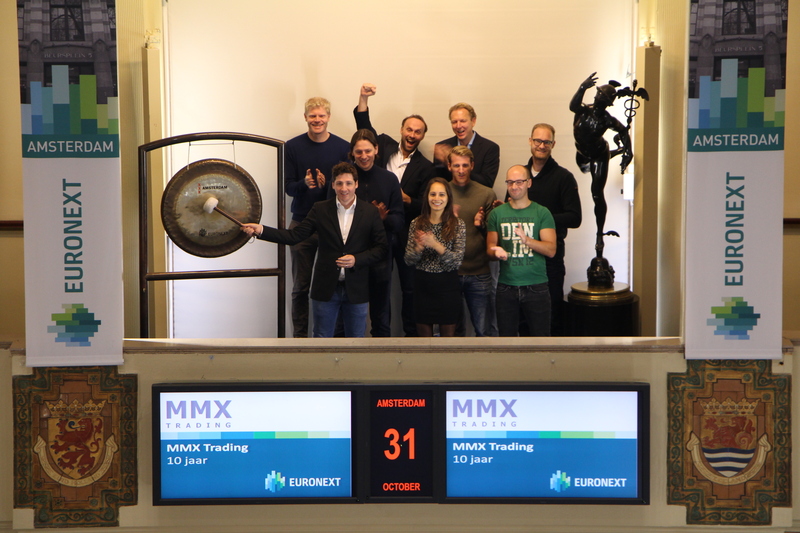 In honor of this a group of tour guides, also known as Mercurions, open trading at the Amsterdam Stock Exchange. 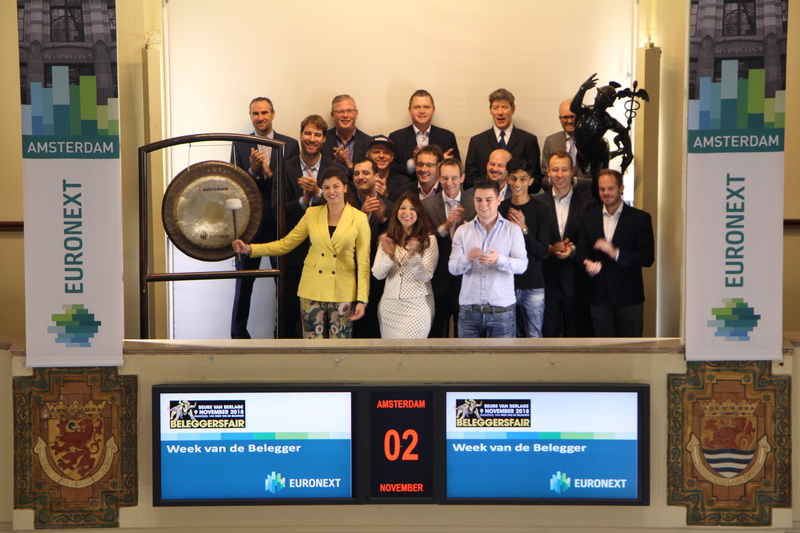 The AEX Experience is a 75 to 90 minute interactive educational tour through the Euronext building at Beursplein 5. Visitors get the chance to have a look behind the scenes, including the history of the stock exchange, the emergence of stock trading, the listing process of a company and the different indexes are amply treated. In addition, you can participate in a trade simulation where you are in the shoes of a stockbroker. 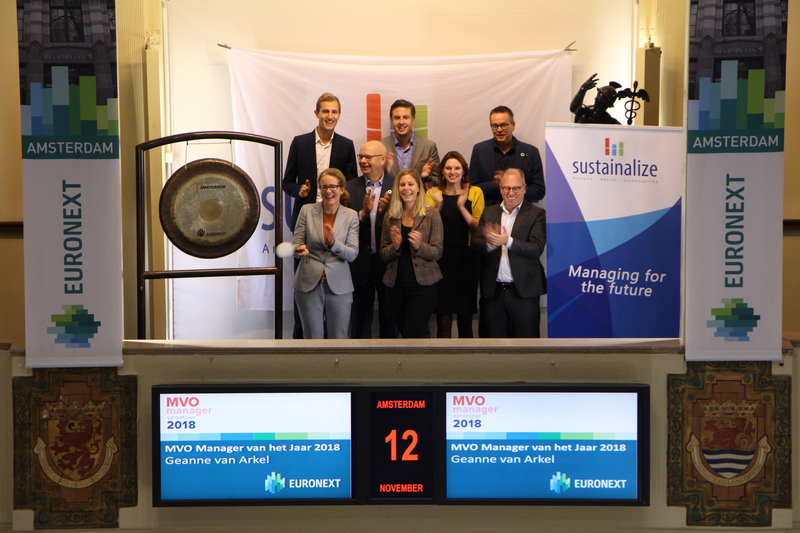 Geanne van Arkel, Head of Sustainable Development bij Interface, has been elected as ‘CSR Manager of the Year 2018’ and opened the trading day with the gong. The CSR Manager of the Year election kicked-off in 2012. Organiser is CSR consultancy Sustainalize, together with Moonen Packaging and Sustainable Talent as their partners. The purpose of the election is to recognize the efforts and results of inspired CSR managers. Geanne van Arkel was elected CSR Manager of the Year 2018 at the Dutch National Sustainability Congress on November 8th. A jury had previously nominated three persons for this title. Besides Geanne van Arkel. Jaap Petraeus, Manager Corporate Sustainability bij FrieslandCampina, and Marlijn Simons-Somhorst, Manager Corporate Responsibility & Relations bij Lidl Nederland, were nominated. 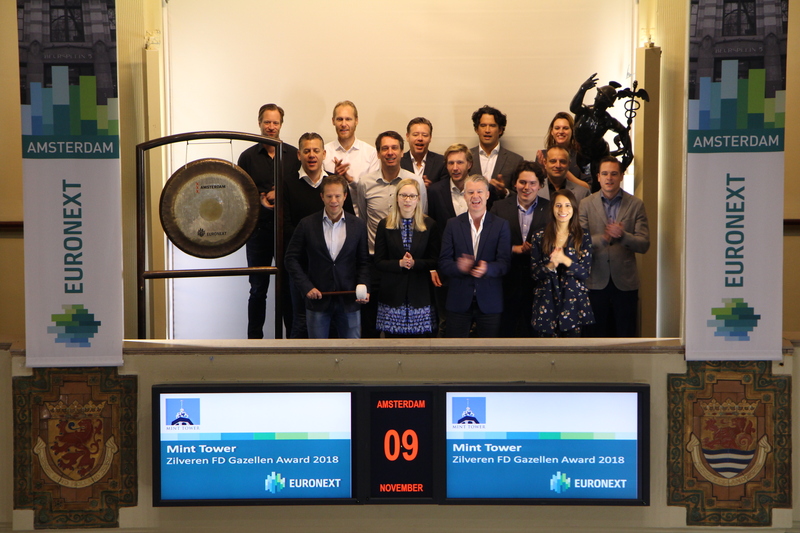 Mint Tower Capital is one of the fastest growing companies in the Netherlands. The hedge-fund has won a silver FD Gazellen award on 6 November 2018, thanks to a growth in revenues of nearly 93 percent in two years’ time, as well as an increase in staff; from 9 to 25 FTEs. 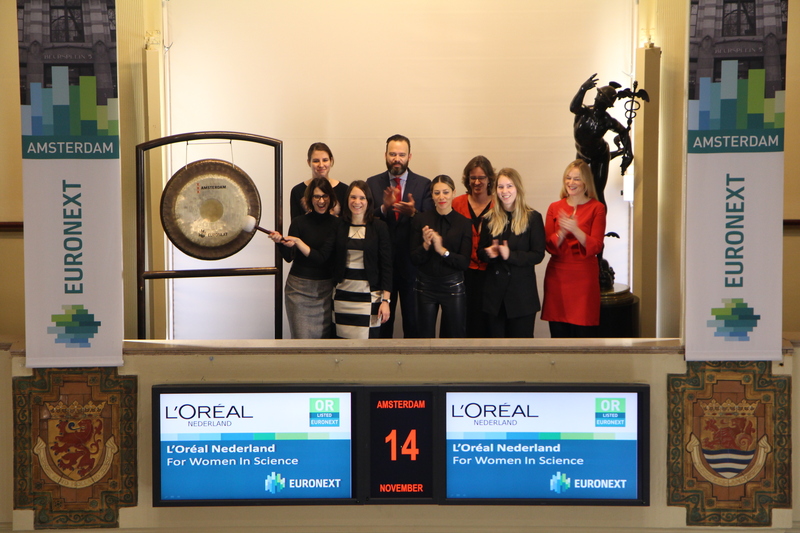 On this occasion Joris Hoedemaekers opens trading at Euronext Amsterdam. Every year, Het Financieele Dagblad hands out the FD Gazellen Awards to companies that have grown at least 20% in revenues over the past three (financial years). In addition, the FD Gazelles are profitable in the final year of the surveyed period. This year, the rules have been tightened. A company should have a minimum turnover of € 250,000. The three turnover categories are now: small (€ 250,000 to € 2 million), medium-sized (€ 2 million to € 10 million) and large (more than € 10 million). Furthermore, the ranking has been adjusted. In addition to revenue growth, this year staff growth and the profit margin will also be taken into account. A total of 287 companies were awarded with the title FD Gazelle, as a reward for their above-average growth. This concerns companies from; North Holland, South Holland and Flevoland, that grew at least 20% in turnover over the past three financial years. 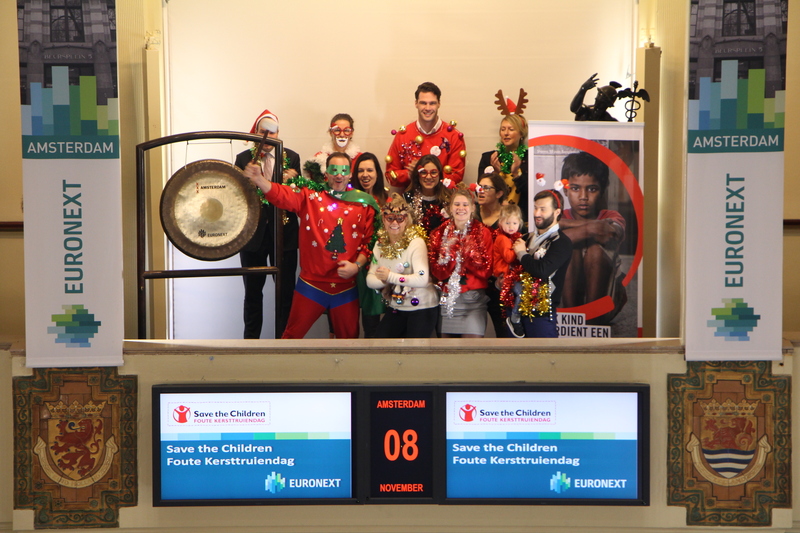 On 14 December Save the Children, an organization active in over 120 countries that helps children in need, organizes a ‘Christmas Jumper Day’ to raise money and create awareness. The money raised will be used to help reunite refugee children with their parents, as well as collect food parcels and provide warm clothing, blankets and shoes. On this day, thousands of people everywhere in the Netherlands are putting on their ugliest Christmas sweater for a good cause, trying to gain as much attention as possible. Actors Esmee van Kampen and Eric Bouwman, ambassadors for Save the Children, will help make a lot of noise for this charity cause with the sounding of the gong. 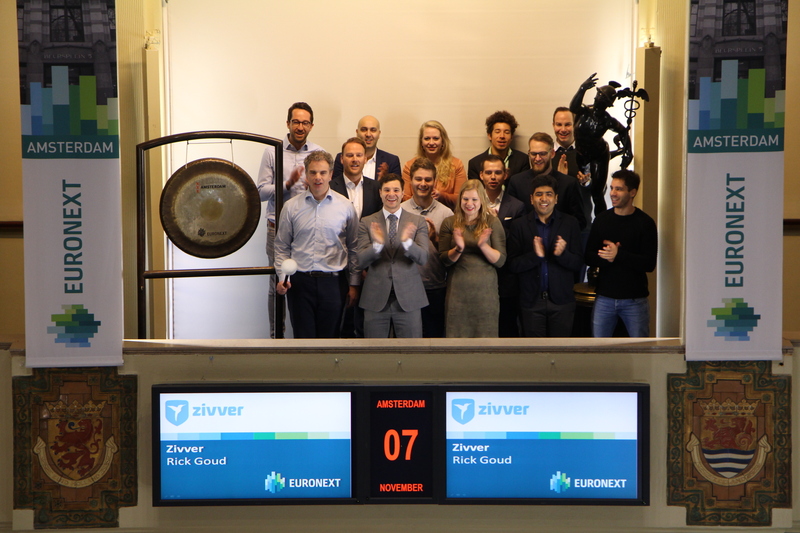 ZIVVER, the platform that helps companies communicate securely, will open the Amsterdam exchange market today. Rick Goud, CEO & Co-founder of the Amsterdam-based company, will sound the gong during the ceremony. ZIVVER celebrates that the company has raised a growth financing of 12 million dollars. ZIVVER is taking the opportunity to thank their leading European investors Dawn Capital, DN Capital and henQ Capital, who contributed to the Series A investment. The investment round contributes to an accelerated, further expansion of ZIVVER to other markets, such as the legal and services industries, and to other countries. ZIVVER offers a user-friendly solution for secure e-mail and file transfer. They focus on the most common cause of data leaks: human errors, such as addressing e-mails incorrectly, adding incorrect attachments and using weak passwords. Since the introduction of the platform in 2017, ZIVVER has gained a significant market share in the Dutch healthcare and public sector, including twenty percent of all Dutch hospitals and twenty percent of Dutch municipalities. Vincent Macq, Managing Partner du bureau bruxellois de Freshfields, sonne la cloche Euronext à l’occasion d’un double anniversaire : les 275 ans d’existence du cabinet et leurs 30 années de présence en Belgique. 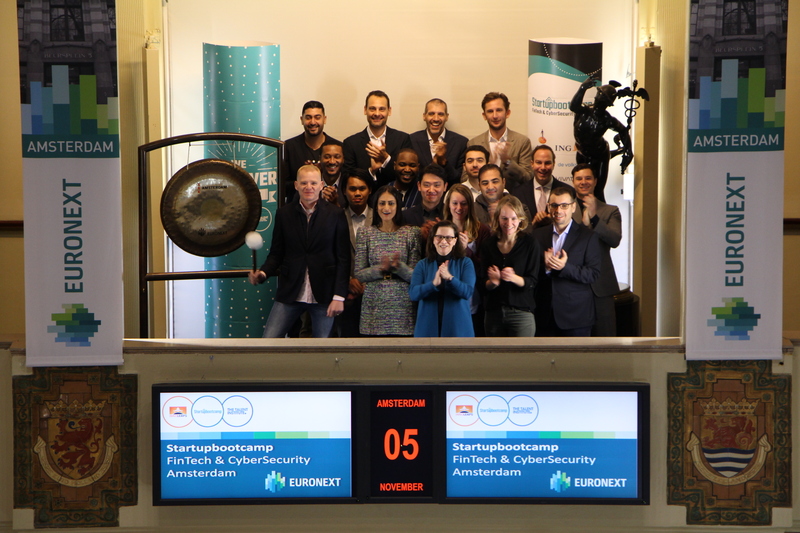 Startupbootcamp FinTech & CyberSecurity visits the Amsterdam stock exchange with the managing team and CEOs of the participating teams that will join the accelerator program on 5th of November 2018. Michael Dooijes, Co-founder & Managing Director, sounds the gong as a kick-off of the startup acceleration program. The selection days took place on the 2nd and 3rd of October in Amsterdam. Out of more than 500 applications, 23 startups in Fintech and CyberSecurity were invited to present their ideas to over 100 mentors & partners. At the end 12 startups were selected to join the 2019 program. Founded in 2010, Startupbootcamp is an award-winning global network of industry-focused accelerator programs. With 20+ programs in Europe, Asia, North & South America, MENA & Africa, selected startups gain access to the most relevant mentors, partners, and investors in their industry. Up to date, Startupbootcamp accelerated close to 700 startups globally. 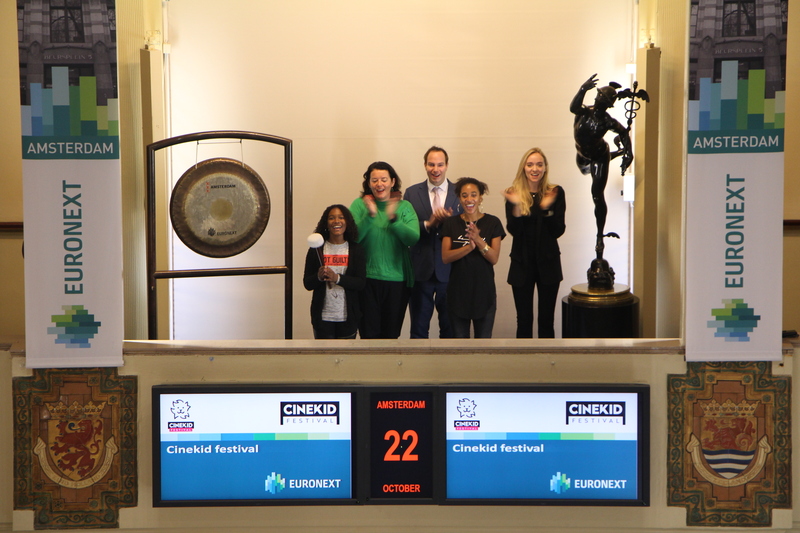 In honor of the Week of the Investor, Zita Chengadu, coordinator of the largest investor club in the Netherlands, 'Bull Up'. During the Week of the Investor (2 to 9 November), national activities, inspiring programs and meetings provide answers to the increasing demand for knowledge and information in the area of ​​personal finances. The focus of the Week is on education and information. It enables a wide audience to inform themselves about the latest developments and trends. The Week ends on Friday 9 November with the InvestorsFair 2018 in the Beurs van Berlage in Amsterdam. The Cashcow Awards for the best financials are also presented here. The gong is sounded by Jordy den Haan, Community Manager of the Museumnacht Amsterdam Foundation. In the run-up to Museumnacht on Saturday 3 November, he and his team were invited to come and open the exchange. The foundation was established in 1999 to build a bridge between the Amsterdam museums and the young people of the city. It is the mission of the Museumnacht Foundation to constantly activate a new generation of young people to visit a museum. With a core focus on the annual Museumnacht Amsterdam. During this night over 55 museums open their doors during the night for more than 32.000 young people from Amsterdam. 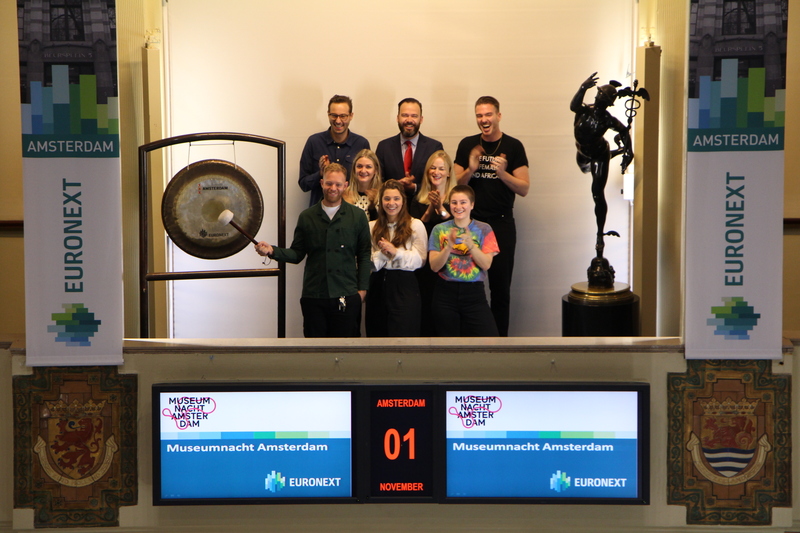 Their function translates into a vision on youth marketing in the form of an advisory, investigative and experimental role in relation to the Amsterdam museum sector. In this way, the Foundation informs, inspires and advises the Amsterdam museums to increase the proportion of young museum visitors living in the Greater Amsterdam region. Michel Suzor opens the trading day to celebrate the 10th anniversary of MMX Trading. Michel Suzor is a multiple winner of the MMX Open and COO of the company. MMX Trading is a market maker on several exchanges in Europe. The Inner Circle, based in Amsterdam, has been ranked number one in the Technology Fast 50 ranking 2018, the list of the fastest growing technology companies in the Netherlands. By sounding the gong CEO David Vermeulen celebrates winning. With their selective dating app they connect ambitious, like-minded people. With a revenue growth of 3460% over the last four years, the company is at the top of this list. 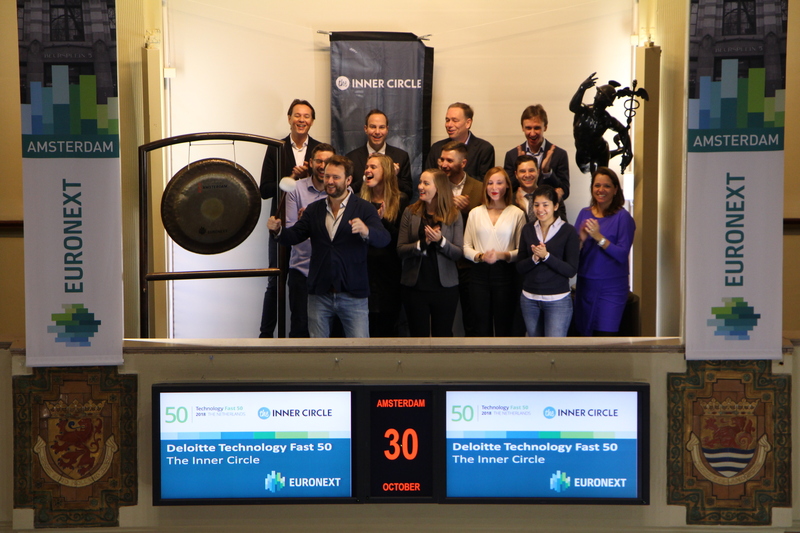 Deloitte organizes the Technology Fast 50 together with its program partners ABN AMRO, Euronext, Kennedy van der Laan and Oracle NetSuite. The Deloitte Technology Fast 50 is the ranking of the 50 fastest growing technology companies in the Netherlands. The Fast 50 participants are the top entrepreneurs of the future who think quickly and play a leading role in their field. Furthermore 2 companies have been awarded in the Rising Star category, the category for emerging innovative companies younger than 4 years. Temper won the Rising Star 2018 award, while Amber was announced to be the Most Disruptiove Innovator 2018. 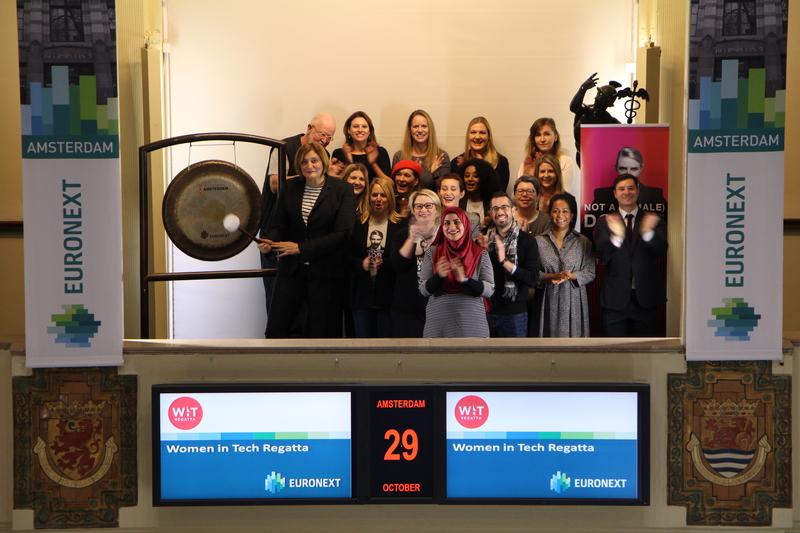 Snezana Zivcevska-Stalpers sounds the gong at the Amsterdam Stock Exchange celebrating the start of the first edition of Women in Tech Regatta Amsterdam 2018 and in that way raising awareness for the need of more women and girls in STEM (Science, Technology, Engineering and Mathematics) in The Netherlands and globally. Snezana is Project Manager Tech & Innovation at IBM and an UN Women Champion for Change for gender equality and women’s economic empowerment. She is also nominated for Ethnical Business Woman of The Netherlands for 2018 and Global Female Leader 2018. After Seattle and Vancouver, Women in Tech Regatta has come to Amsterdam. It is an authentic one week-long event with participation of more than 500 technology professionals and 15 non-profit tech organizations. Over 100 speakers from IBM, Microsoft, Deloitte, Oracle, Ebay, Salesforce.com, TomTom, Amazon and many others will share their expertise on 30 subjects in 5 different areas: Tech, Leadership, Diversity, Start-Ups, and Career. 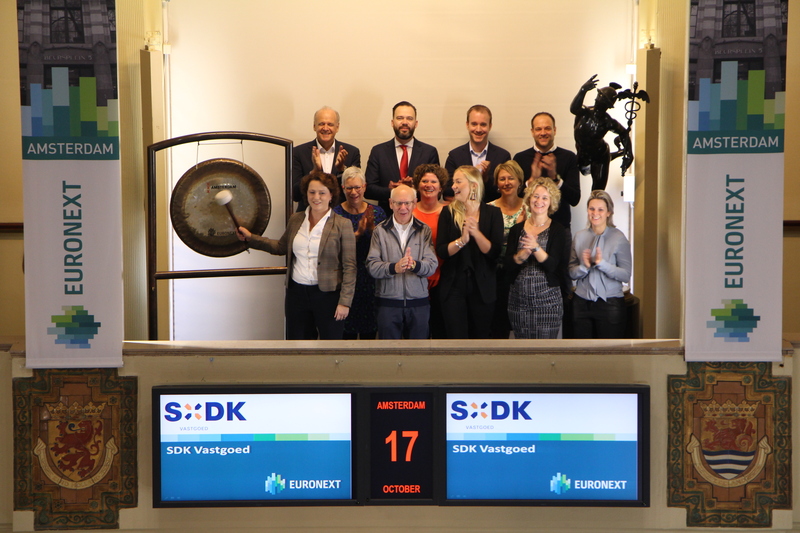 Earmonn Sean opens, as one of the youngest new clients of BinckBank, the markets at Euronext Amsterdam by sounding the gong. Like BinckBank, he celebrated his eighteenth birthday recently. In honour of achieving this milestone, he is accompanied by a first-time BinckBank customer and employees who have been employed by BinckBank from the start. 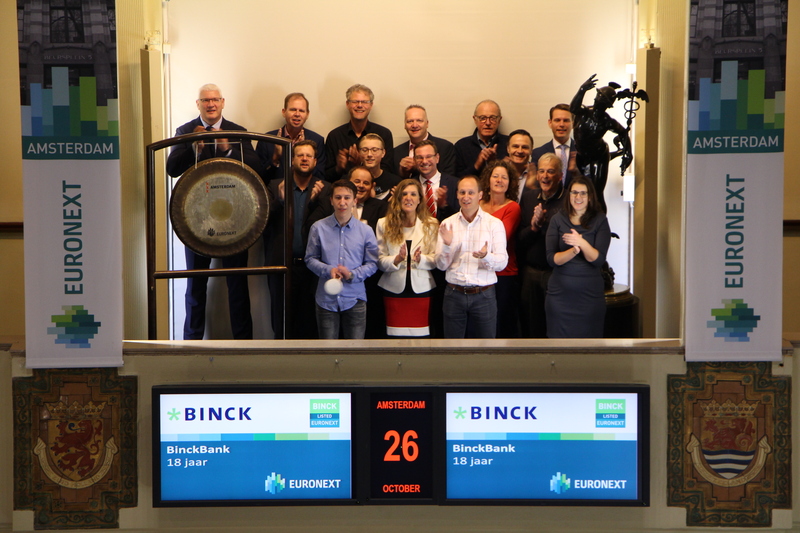 BinckBank began in 2000 with the dream of giving retail investors access to the stock exchange and providing them with the same tools as professional investors. Accordingly so their founders started form an attic room to create the trading platform facilitating people to invest themselves independently of the traditional incumbent banks. Now they have turned 18, the age to learn to stand on your own feet more and more. BinckBank is happy to contribute to that. Other than that they will continue to do everything to help people invest their financial freedom as effectively as possible. In order to help investors and saver to realize their financial ambitions, BinckBank now also offers innovative solutions in the field of discretionary asset management and savings in addition to our trusted Self-Investing proposition. Alexander Hodac, CEO de IMMOBEL, a sonné la cloche d'ouverture des marchés pour célébrer l'émission des obligations Immobel. En octobre 2018, IMMOBEL a lancé une émission d’obligations pour un montant maximal de 100 millions d’euros sur des durées de 5 et 7 ans. IMMOBEL confirme ainsi sa stratégie financière de diversification de ses sources de financement et sa détermination à poursuivre le développement de son portefeuille immobilier en Europe. 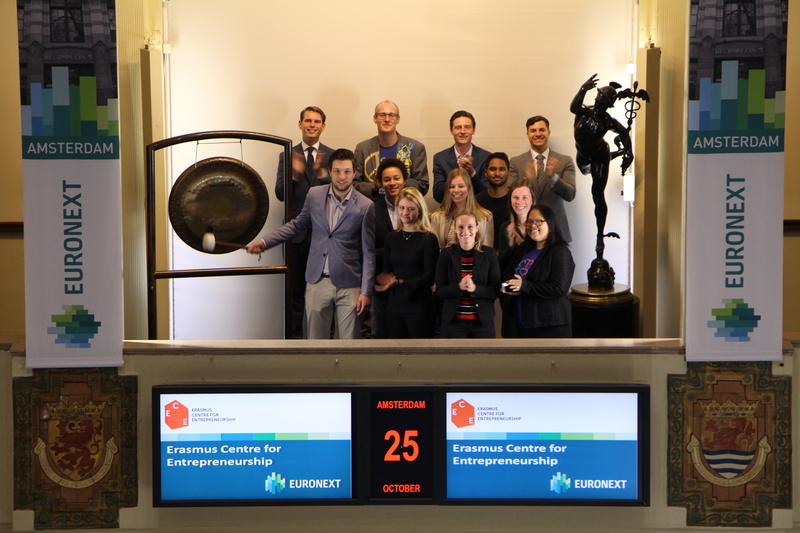 The Erasmus Centre for Entrepreneurship (ECE) opens trading together with Erasmus alumni to raise awareness for a new scale-up program for young entrepreneurs. The ECE, as part of the Erasmus University of Rotterdam, is the leading entrepreneurship centre of Europe. A group of young entrepreneurs, selected from the start up programme of the ECE, are now supported in a new scale-up program. The ECE and the Erasmus Trustfonds joined forces this year to help ‘the next generation entrepreneurs’ grow. The Erasmus Trustfonds is partly supported by entrepreneurial alumni of the Erasmus University Rotterdam and part of the funds are reserved for stimulating entrepreneurship and the new generation. The program focuses on ‘doing business’ and opening up the network of the Erasmus University Rotterdam. 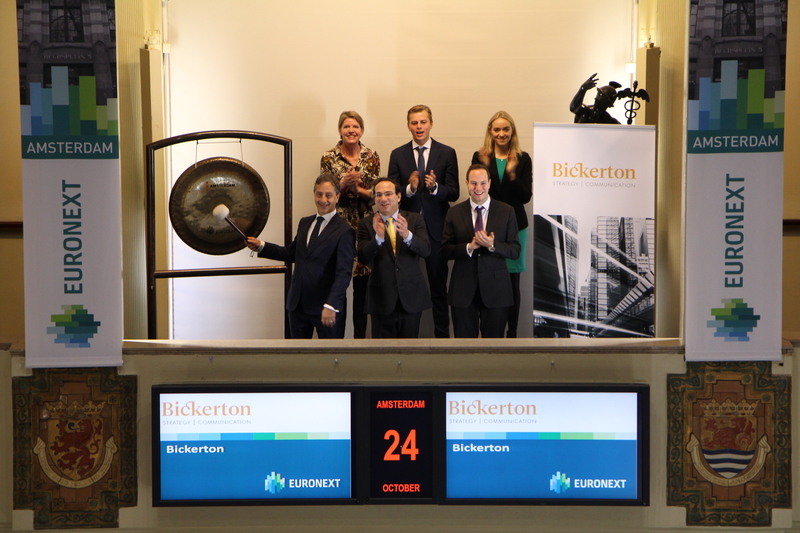 The Bickerton-team opens trading at Euronext Amsterdam to mark the official launch of Bickerton, a new independent strategic communications agency in the Netherlands. From offices in Amsterdam and The Hague (Public Affairs), the agency will meet growing demand for high-quality integrated communication strategies that effectively address the challenges that shape today’s business and society. Active in both ongoing business and special situations, including M&A transactions and capital markets events, Bickerton provides financial and corporate communications, internal communications, and governmental affairs advice to public and private corporations and institutions, boardroom executives, funds, industry bodies and NGOs. The Bickerton team has held leading roles with listed companies, strategic communications agencies and the international media. 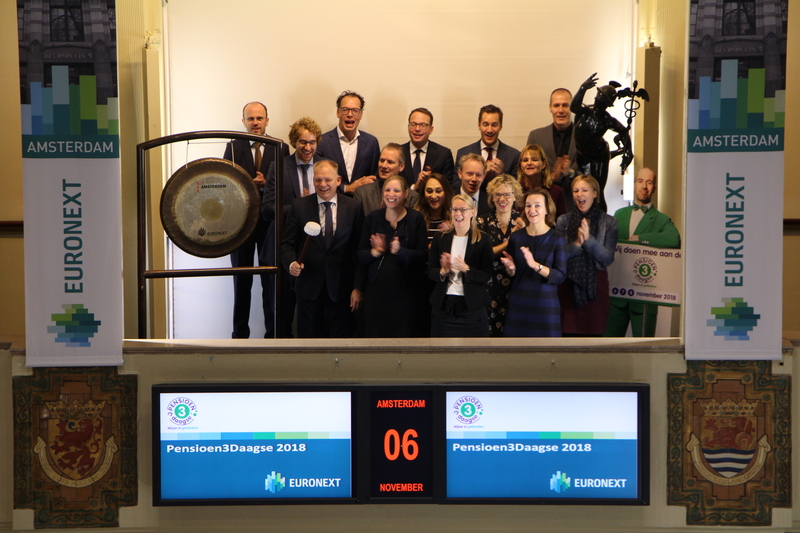 Eurowijs initiator Hilde Krens today opened trading on the Amsterdam Stock Exchange to celebrate its 5-year anniversary. She is joined by six students from primary and secondary schools. Eurowijs teaches children in primary and secondary school ‘how to deal with money’. One out of three primary schools is already using their teaching material and method, thereby reaching more than 220,000 students, of which almost ten percent is located in Amsterdam. 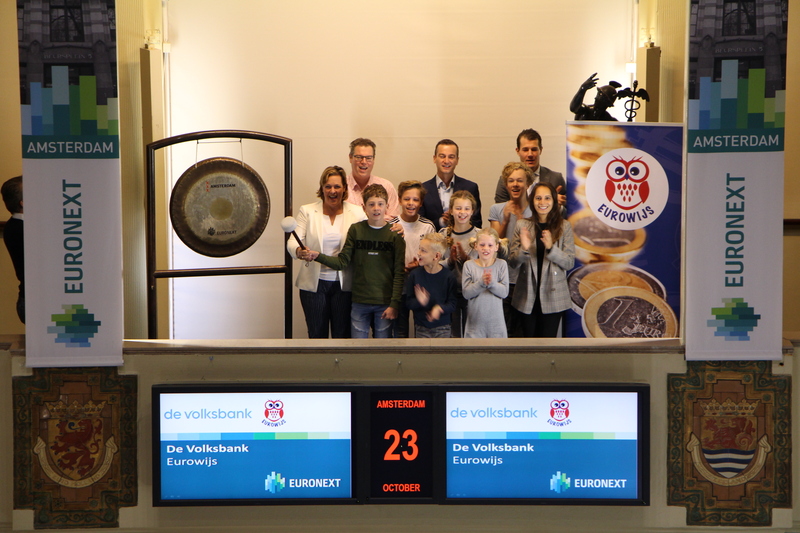 Eurowijs is an initiative of de Volksbank and has been developed to teach primary and secondary school students of all ages how to deal with money. Children are taught how to save, spend and count with the euro in a playful way. Cinekid is the world's largest media festival for young people aged between 3 and 14 years. Almost 65,000 children and their supervisors visit the festival at the Westergasfabriek in Amsterdam and 40 film theaters in the Netherlands every year. The festival hosts and organizes safaris in the MediaLab: the largest digital playground in Europe with interactive art installations, games and workshops. Cinekid takes place from October 20th to 26th 2018. Le Champion and NN open trading to raise awareness for the TCS Amsterdam Marathon, which takes place on Sunday 21 October. Tadelech Bekele , athlete of the NN Running Team, sounded the gong. NN is sponsor of the TCS Amsterdam Marathon, in which 45,000 runners participate. This upcoming Sunday 45,000 athletes will enjoy their participation during the full marathon, half marathon, 8K or Kids Run. The full marathon, in possession of the IAAF Gold Label, has one of the fastest courses in the world. Highlights are the start and finish in the Olympic Stadion, the passage through the Rijksmuseum and the Vondelpark and along the Amstel River. In total Le Champion brings annually about 200,000 people in motion. There 20,000 members of the association. Robeco and investment experts Pim van Vliet and Jan Koning sound the gong to raise awareness for the investment behaviour of the conservative retail investors. Van Vliet and de Koning wrote a book two clearly explain the phenomenon and setup of a conservative investment portfolio for private investors. With this book they pay attention to the private investor who, according to them, invests in a non-sustainable investment strategy, can become the profitable investment expert. This is also the philosophy behind Robeco's conservative equity funds, a value range that Van Vliet himself is at the basis of, and said more than 10 years ago. An example of this is Robeco US. Xavier Barbaro, Président Directeur Général de Neoen, ouvre les marchés financiers à Paris. Neoen est un producteur indépendant d’énergie renouvelable de premier plan (premier producteur indépendant d’électricité à partir d’énergies renouvelable en France), dont l’activité se concentre sur la production d’énergie solaire et éolienne, ainsi que sur le développement de solutions de stockage d’énergie de pointe. Neoen est principalement présent sur trois zones géographiques, à savoir la zone Europe-Moyen-Orient-Afrique (notamment en France, au Portugal et en Irlande), l’Australie et la zone Amériques (notamment au Salvador, au Mexique, en Jamaïque, en Argentine et aux Etats-Unis). Au 30 juin 2018, le groupe détenait et exploitait des installations photovoltaïques et éoliennes, représentant une puissance installée cumulée de 1 830 MW en exploitation et en construction (dont 126 MW au titre d’installations de stockage d’énergie), à laquelle s’ajoutent 15 MW de puissance installée relative à la centrale biomasse du groupe. Sur les 1 830 MW, 1 011 MW provenaient des installations photovoltaïques et 819 MW des parcs éoliens. Jolanda Maasakkers, executive secretary of real estate developer SDK Vastgoed (holding company VolkerWessels) has been awarded with the price of ‘Secretaresse van het Jaar 2018’ in the beginning of this year. Shoevers organized in association with Pimm solutions and Experis the 33rd edition of this prestigious event. The theme of this year was Fit for the Future. After three exciting preliminary rounds there were only three finalists left. The day of the finals, 250 colleagues and a jury (consisting of Marguerite Collot d’Escury secretary of Prime minister Mark Rutte, Annelies Bessels Chairman of the Dutch association of executive secretaries and the winner of the title from last year Kelly Moerbeek) voted for the winner. According to the jury report, Jolanda Maasakkers is “a true professional that showed tremendous growth during her nomination period for the title. Jolanda encouraged people to keep on learning and because of this she is an amazing ambassador for the field of secretaries”. Marc Oursin, CEO of Shurgard Self-Storage, a sonné la cloche d'ouverture des marchés à Bruxelles.